May these quotes about giving and receiving a Helping Hand encourage you and inspire you. Instead of pointing fingers, we should all offer a helping hand. Condemn none: if you can stretch out a helping hand, do so. My values, our values, aren't about pointing fingers. They are about offering a helping hand. the helping hand of a neighbor. There are people who help you in life. it's my duty to help younger artists. including two long-run and top-10 dramatic television shows. to the next generation of young Latinos coming up behind me. more by helping yourself less. that we are growing jobs by helping small business. helping me to commit to paper the feelings I had. I really heard my father speaking to me from the other dimension. and we are helping to make it better for our children's future. who want to help build a better life for the community in which they serve. I could try and find it in me. to make our world a safer place. In high school, I was Mr. Choir Boy. parts and our choir teacher would ask me what songs we should do. Gleason became like a mentor of mine. our families be able to help themselves. President Bush work to reduce the drug problem. what a fool you are but how beautiful that is at the same time. that includes actively helping other people. But how can we tell you our plans when we haven't finished making them yet? I never thought in terms of being a leader. I thought very simply in terms of helping people. I have only one thought in mind: helping people with their money. I am serving the Lord and helping women save babies. Everyone seemed to be doing well except me and my career. but also the community at large. helping companies grow from the ground up. you're automatically a good sport. by helping to promote liberty and freedom around the world. 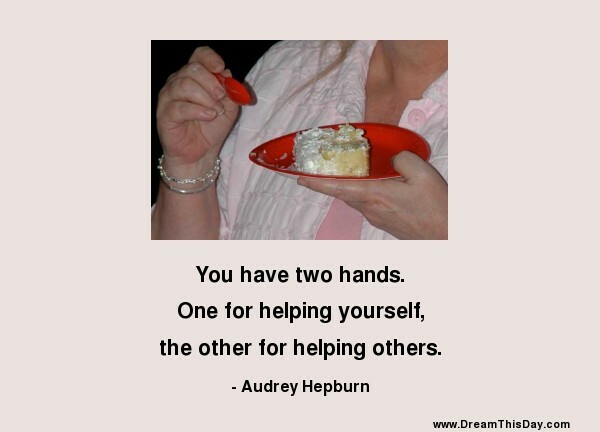 Thank you for visiting: Helping Hand Quotes.